You might have heard of some Mexican destinations from television or the cinema, places such as Acapulco, Cabo San Lucas, Ixtapa, Puerto Vallarta and Cancun. With its official Spanish language, the physical latino characteristics of its population, authentic foods and beguiling history witnessed by the Ancient Aztec pyramids Mexico is an enthralling and infinitely interesting destination to visit. From sunny beaches to archeological and historical zones, from golf courses to nature and adventure trails, plan a vacation that perfectly matches your style and tastes. Immerse yourselves in Mexico’s typical historical and contemporary architecture, enjoy the country’s archeological treasures and absorb its interesting historical heritage. Experience extreme sports, outdoor activities for all the family, camping, hunting, kayaking, whitewater rafting and fishing. Admire typical arts and crafts and participate in festivals that promote Mexico’s unique traditions. Make time to explore its Pacific Coast beaches or its Caribbean Beaches. Golf, sail, surf or just plain relax in a top-notch spa that will chase your everyday stresses away. With atypical natural and cultural settings all activities undertaken on Mexican soil will have that unique Mexican tinge. The country’s varied backdrop includes nature reserves, picturesque towns, beautiful colonial cities, the Gulf of Mexico and the Pacific Ocean. 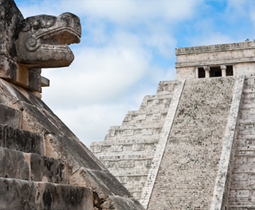 The Yucatan Peninsula, on the other hand, provides an introduction to the enthralling Mayan world. The white-sand beaches and blue waters of the Caribbean Sea additionally offer lovely swimming and scuba diving locations.